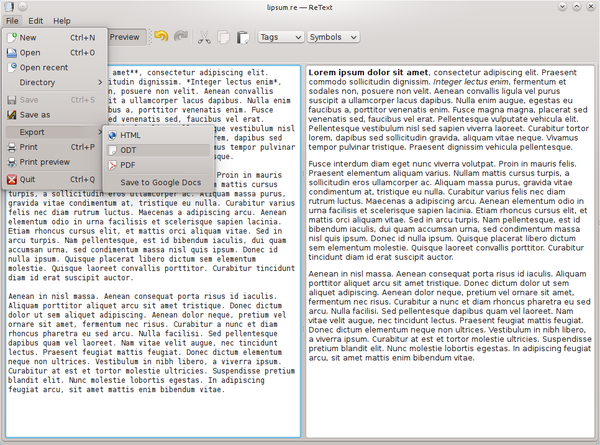 ReText is a nifty text editor for those who appreciate markup systems like reStructuredText and Markdown. The application allows you to easily create formatted texts using either reStructuredText or Markdown markups, and then output the result in several formats including ODF, PDF, and HTML. In addition to that, you can upload formatted documents to Google Docs directly from within the editor. ReText boasts other handy features, including HTML syntax highlighting, auto save option, and support for CSS styles. The editor sports a tabbed interface, so you can manage multiple text files, while the Preview pane lets you view the formatted output of the currently edited file. The Tags and Symbols drop-down lists allow you to quickly insert often-used HTML tags and symbols like em dash, right and left arrows, dot, etc. Like any text editor worth its salt, ReText supports a simple find feature as well as undo and redo operations. The only missing piece here is the lack of word count and line numbering features. ReText is written in Python, and the text editor requires no installation. However, it depends on a handful of packages, including python-qt4, python-markdown, python-docutils, and python-gdata. These packages are available in the software repositories of most mainstream Linux distributions, so you can easily install them using your distro's package manager. Grab then the latest release of ReText and unpack the downloaded archive. Make the retext.py file in the resulting directory executable using the chmod +x retext.py command, and launch the editor by running the ./retext.py command (or double-click on the retext.py file in the file manager).